Gillian Galbraith's first novel is a neat, competent little thriller, a police procedural set in Edinburgh. Three people are murdered in quick succession: a consultant doctor, a labourer and a lawyer. The police who investigate the crimes are represented to the reader through the eyes of Alice Rice, a young graduate entrant, who has little self-esteem despite being quietly competent at her job, not to mention extremely dedicated. She and her partner Alistair (work partner, not personal partner - it is rather hammered home that Alice is without a boyfriend) interview the relations of the victims and try to find a connection between them. Then a fourth person is murdered. This book comes highly recommended: it has been likened to Ian Rankin's bestselling Rebus series and has a blurb endorsement from Alexander McCall Smith, no doubt in both cases due to the Edinburgh connection. Yet although it is an easy read, it is slightly wooden. The initial three murders seem to happen in unbelievably quick succession, and Alice seems to be left to her own devices rather too much instead of her superiors taking an active role in leading the investigation. The author's strategy of describing someone's life in a vignette and revealing at the end of the chapter that this person is about to be murdered is rather depressing, although we are spared the gory details. Many details of the investigation are unconvincing. One example is when Alice asks a lawyer friend of hers to search a legal database for any relationship between the victims. To me, this seems unrealistic. Why aren’t the police doing this (at one point it is mentioned that an IT system is down, but that could not hold for a quadruple murder investigation, surely)? The solution to the murderer's identity comes directly from this simple piece of matching. When the murderer is identified, the choice of victims seems illogical, as there are two people who are directly responsible for the tragedy that motivates the killer, yet who don't feature in the book at all. Why not? We aren't told. The author has talent, and Alice is a sympathetic heroine who has plenty of scope for future character development. Sometimes the writing is poignant, for example the description of little Davie's life. But overall, the plot and the characters are too mechanical. Although several members of Alice's colleagues are sketched out, they don't stick in the mind in the way that, say, Jan Costin Wagner achieves so apparently effortlessly in ICE MOON, or Hakan Nesser in BORKMANN'S POINT. 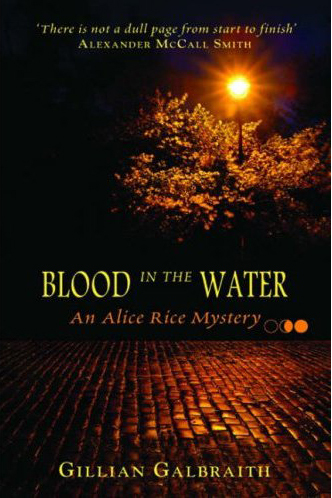 Nevertheless, BLOOD IN THE WATER is a pleasant, if not very memorable, read.